2015 Chevrolet Tahoe / Suburban Pros and Cons: Why (Not) This Car? When you retain a three-quarter share of a market segment even after Ford, Toyota, and Nissan take their best shots, but tastes have changed and sales are about half their circa-2000 peak, what do you do? Some people, especially those with no stake in the outcome, will advise you to walk away and instead expend your resources on the latest hot thing. But if you're General Motors, and you're still earning a billion or two each year by selling far more erstwhille symbols of American pride than anyone else, you spend a few hundred million to thoroughly redesign and re-engineer your large SUVs. Nissan and Toyota last updated their Canyonero competitors just before the bottom fell out of the segment, and seem none too keen on throwing good money after bad. But Ford, which seriously challenged GM's hegemony during the boom, isn't as ready to cede the match. For 2015 it has also updated its large SUVs, if not as thoroughly as GM has. With large SUVs out of fashion, their sales now depend on best serving whatever transportation needs rule out a smaller vehicle. By spending the money for a full redesign, does the Chevrolet Tahoe best serve these needs? Or does the Ford Expedition retain some clear advantages? Why the 2015 Chevrolet Tahoe / Suburban? GM's latest investment in its large SUVs bought more than new exteriors and interiors. It also equipped them with the latest features. Don't want to have to take your key out of your pocket to unlock or start the Chevrolet Tahoe? Done. How about a heated steering wheel? Done. And the latest safety tech, including forward collision warning and lane departure warning? Also done. Not that the Expedition's feature list reads like that of a Yugo. Many other features--including HID headlights, rain-sensing wipers, blind spot warning, obstacle detection on both ends, rearview cameras, heated-and-cooled front seats, heated second row seats, power-folding third-row seats, power liftgate, and power-retracting running boards--are available on both the Chevrolet and the Ford. 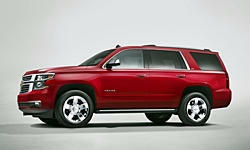 Regarding the Chevrolet Tahoe's new, blockier exterior: I'm not a big fan. The 2007-2014 sheetmetal was less slabsided and directed the eye horizontally more than vertically, yet was no less up-to-date. The same cannot be said for the Ford. Despite three refreshes, the Expedition's upper body doesn't appear to have changed in the nearly two decades since the model was introduced. Windows three inches taller than the Chevrolet's (20.5 vs. 17.5, a big difference) might deliver outstanding outward visibility, but they're so mid-90s. GM's money was better spent inside the Tahoe. 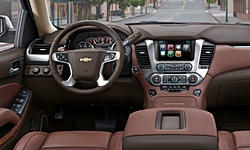 Compared to the Ford's, the Chevrolet's interior appears more sophisticated and upscale. While both models suffer from a surfeit of silver plastic trim, the Tahoe's interior panels include far more soft-touch surfaces. Those on the center console and lower instrument panel are even stitched. Unusual for a $60,000 vehicle, the Expedition's entire instrument panel is hard plastic. While both manufacturers added their latest infotainment systems, both also learned from Ford's earlier mistakes and included a nearly ideal number of large, logically arranged, and easily reached physical knobs and buttons. Some (perhaps more than some) people are drawn to large SUVs because they like to feel like the king of the road when behind the wheel. Others need a lot of space while driving, or at least feel they do. Few vehicles have more front seat room than the new Tahoe. With an inch-and-a-half less shoulder room, the Ford's front-row dimensions aren't quite as generous, and its taller, shifter-festooned console is more intrusive. The front seats are comfortable in both. The Expedition's are a little wider and softer, and they're upholstered with especially rich hides in the King Ranch and Platinum (vs. the most recently tested and photographed Limited). Whether this is preferable is a matter of taste. If you don't need the 65 inches of shoulder room provided by these large SUVs, and don't desire the "king of the road" feeling they deliver, you still might need their superlative towing capability. Car-based crossovers tend to top out around 5,000 pounds. With the Tahoe you can tow 8,400 lbs. (8,600 with 2WD). When equipped with a towing package (standard on the Limited and up), the Expedition does even better, 9,200 lbs. Given how often these numbers are fudged, I'll give the Chevrolet the benefit of the doubt and consider its stat equally impressive. Both towing packages include an integrated trailer brake controller. Beyond towing capacity, vehicles with long wheelbases tend to be less susceptible to trailer sway. The extended versions of these SUVs, the Chevrolet Suburban and Ford Expedition EL, are even better suited to hauling an 8,000-pound camper or boat. You didn't expect to see fuel economy among the reasons to buy a Tahoe, did you? Of course, fuel economy remains well below that for most smaller, lighter vehicles. But General Motors has substantially improved the SUV's efficiency by adding variable valve timing, direct injection (fuel is injected under high pressure directly into the cylinder, rather than into the manifold), and cylinder deactivation to the 5.3-liter V8. EPA ratings improved from 15 city, 21 highway to 16/23 with 2WD and 16/22 with 4WD. I observed averages as high as 21 in the suburbs and 26 on the highway, quite impressive for an 80-inch-wide, 74-inch-tall, three-ton vehicle. Transitions between V4 and V8 operation are not perceptible, with the engine usually in the former mode when not accelerating, even at highway speeds. Ford took a different approach to improving fuel economy, replacing its 5.4-liter V8 with a turbocharged 3.5-liter V6. The resulting EPA ratings of 15 mpg city and 20 mpg highway are better than before, but aren't as good as the Tahoe's. My trip computer averages were similarly two to three mpg shy of those observed in the Tahoe. Why Not the 2015 Chevrolet Tahoe / Suburban? Both the Tahoe and Expedition have roomy, comfortable second-row seats, with a slight edge to the higher cushions in the Chevrolet. Bonus points to the Tahoe for automatic rear climate controls (they're manual in the Expedition). Move to the third-row seat, and you'll wonder why, despite redesigns for 2007 and 2015, General Motors has stubbornly refused to follow Ford's 2003 switch from a solid rear axle to an independent rear suspension. With a solid axle, the rear floor must be high to permit the rear differential to travel up and down when a wheel hits a bump. Consequently, the Tahoe's third row seat must be very thinly constructed and mounted very close to the floor. Even pre-teen children won't be comfortable in it. In sharp contrast, the Expedition's third-row seat is higher off the floor than its second-row seat, much less the ridiculously low third row in the Tahoe, and is--surprise--considerably more comfortable as a result. The Suburban's third-row seat is roomier than the Tahoe's but still far inferior to the Expedition's. General Motors didn't want to switch to an independent rear suspension, but it did want to match the Ford's flat cargo floor. The solution: they filled the area behind the third-row seat with a storage compartment the top of which is level with the folded seats. The disadvantage of this approach: the resulting floor is over 40 inches off the ground, compared to an already high 34 inches in the Expedition. Yet the roof is actually lower in the Tahoe. A higher floor plus a lower ceiling equals less space for cargo. In the Tahoe, there's only a little more than a foot of cargo floor behind the third-row seat. If you want to transport three rows of people plus their luggage, you need the longer (but otherwise identical) Chevrolet Suburban, which dramatically expands the cubic footage behind the third row from 15.3 to 39.3. The same is true of the Ford, even though it can swallow more than the Tahoe. All of the Expedition EL's additional 15 inches goes into the area behind the third row, bumping the cubic feet there from 18.6 to 42.6. For sake of comparison, the largest crossovers can hold about 24 cubic feet behind their third-row seats, while some minivans can hold nearly 40. On top of this, I learned the hard way that groceries placed behind the Tahoe's third-row seat are apt to fall to the ground when the tailgate powers open because the new false floor doesn't extend all the way, and terminates with a steep slope. A cargo net is provided. Use it. And, when asked "paper or plastic? ", you want paper. The seats are easier to fold in upper-level Tahoes, as their rear cargo area includes remote releases for the second-row seats in addition to power-folding third-row seats. To fold the second row in the Ford you have to go through the rear side doors. You can't fold them while standing at the rear of the vehicle. Folding both rows in the Tahoe opens up 94.7 cubic feet, compared to 108.3 in the Expedition. With the long-wheelbase variants, the Suburban and the Expedition EL, the stats are 121.1 and 130.8 cubic feet, respectively. The largest car-based crossovers, from GM, can hold 116--nearly as much as the Suburban, and far more than the Tahoe. Minivans can hold up to 150--but only if you remove their second-row seats, which is too tedious to do often. The only minivan where both rows fold beneath the floor, the Dodge and Chrysler, can hold up to 143.8 cubic feet. The Tahoe wins back some points with its interior storage compartments. As in many recent GM products, one compartment is "hidden" behind the nav display. Another in the center console can swallow a few notebook-sized computers, a purse, or even hanging files. And the compartment behind the third-row seat, with about three inches of vertical depth, should be good for more than leveling the floor. As mentioned when discussing the Tahoe's superior fuel economy, Chevrolet and Ford opted for much different solutions in their pursuit of higher EPA ratings. These solutions also differ in performance. Turbocharged engines generally have their largest power advantage at low rpm. While the Chevrolet's 5.3-liter V8 engine must spin to 4,100 rpm to deliver its max of 383 pound-feet of torque, the Ford's 3.5-liter V6 must only spin to 2,500 rpm to deliver 420 pound-feet. The Chevrolet's power peak is also higher, with 355 horsepower at 5,600 rpm vs. the Ford's 365 horsepower at 5,000 rpm. Sometimes the real world experience doesn't differ as much as the specs suggest it should. If you have a fairly heavy right foot, then the driving experience fulfills the promise of the specs. The Ford engine feels considerably stronger at low rpm, effortlessly accelerating the Expedition's three tons, and only crosses the 4,000 rpm mark when severely prodded. In contrast, the Chevrolet engine tends to spend more time over 4,000 rpm. If you call for brisk acceleration, it readily revs. In its favor, the V8 sounds more thrilling at high rpm. This said, the Ford fails to feel nearly as strong as it is in casual driving. The transmission's gearing is very tall, and both the throttle and the transmission initially resist hard exercise. The Chevrolet might not be as strong, but it's much more willing. Both the Tahoe and the Expedition handle much better than past vehicles size XXL. The Tahoe's steering feels more naturally weighted and intuitive, and as a result it feels better in most driving. But the Ford remains more stable when charging across patchy pavement, and it hustles through curves less clumsily, possibly due to its independent rear suspension. Overall, I'm marking this category a tie, since the Tahoe feels better in casual driving while the Ford performs better when both are pressed. Both the Tahoe and the Expedition are very quiet inside even at highway speeds. But otherwise their ride quality is mixed. They ride well much of the time, with the Ford feeling especially plush on smooth roads. But on less perfect roads either can get jiggly and over wavy pavement the Ford is especially apt to toss from side to side. This is typical SUV behavior, as a high center of gravity precludes a car-like ride. Which large SUV behaves better depends on the specifics of the road surface, so I'm also calling this one a draw. The tested Chevrolet Tahoe LT had conventional dampers. The top-of-the-line LTZ includes adaptive dampers. Ford bundles three-mode adaptive dampers with the $2,080 22-inch wheel option, which was on the tested Expedition. On imperfect roads, "comfort" provides too little body control,while "sport" can feel a little stiff. "Normal" delivers the best ride-handling compromise most of the time. Overall, the advantages of these dampers aren't obvious. When fitted with smaller, less massive wheels and conventional dampers the Expedition should ride at least as well, and quite possibly better. Some people buy large SUVs because their size and weight makes them seem safer. To some extent this is true. Heavy vehicles have an advantage over lighter ones in multi-car collisions. But they're also harder to control and more likely to roll, and so might be more likely to get into an accident. As mentioned when discussing the SUVs' features, the Tahoe offers forward collision and lane departure warnings, while the Expedition does not. The former can especially reduce the odds of an accident. Both the Tahoe and the Expedition earned top ratings in the governments front and side impact crash tests. Neither has been subjected to the IIHS's more difficult crash tests. When similarly equipped with popular options, the Chevrolet Tahoe and Ford Expedition are close in price. The Tahoe lists for about $1,000 more, $60,240 vs. $59,210, but includes about $1,000 in additional content. The price difference remains about the same if you do the smart thing and spend another $2,700 or $2,650, respectively, for the unbeatable utility of the long-wheelbase variants, the Chevrolet Suburban or Ford Expedition EL. This said, Ford offers more optional features on its mid-level trims. With the Chevrolet you have to step up from the LT to the LTZ to get features like 22-inch wheels, adaptive dampers, and power-retracting running boards. If you want one or more of these, but not everything included on the LTZ, the Ford will cost considerably less. Ultimately, the Chevrolet Tahoe's strongest draw is probably the "large and in charge" road presence and driving experience it so effectively delivers. Exclude emotional benefits, and the Tahoe's key strengths are front seat room, towing, and (relatively speaking) fuel economy. But the Ford Expedition can tow at least as much and provides much more room for third-row passengers and for cargo. With either, you should get the long-wheelbase variant so that your XXL vehicle can carry both passengers and their stuff. The Suburban and the Expedition EL will also be more stable when towing a heavy trailer. In functional terms, the regular wheelbase SUVs just don't make much sense. But people don't seem to buy these vehicles for purely utilitarian reasons. If they did, the Expedition EL would rule the segment. Instead, the contest isn't even close. GM continues to sell about five times as many large SUVs as Ford does. Why is the Tahoe the best seller? Well, the Chevrolet and similar GMC Yukon offer much more current styling inside and out, better interior materials, and more of the latest features. Perhaps it's too soon to write off the image and other emotional benefits of owning a large conventional SUV? Chevrolet and Ford each provided an insured vehicle for a week with a tank of fuel. I also drove the Expedition soon after my week with the Tahoe at a regional media association event. 2015 Chevrolet Tahoe / Suburban pros and cons, according to Michael Karesh: the best reasons for buying (or not buying) the 2015 Chevrolet Tahoe / Suburban. Join TrueDelta to post your own impressions. I recently tested this new Tahoe and was greatly impressed. The upscale trim levels are particularly nice. However I was shocked at the $68,000 price point for an LTZ. Granted, it includes nearly every accessory you can imagine... a cell phone charging pad? Exterior styling is nicely restrained while establishing an identity different than a Silverado wagon. Driving dynamics are pretty much what you would expect of a vehicle this size. Steering numb. Power only adequate. The Tahoe feels like what it is... BIG. If you want anything approaching quick you'll need to opt for the GMC Denali or the Escalade which employ the 6.2 liter engine and 8 speed transmission. All this said, GM has done a great job updating their large SUV offerings. If this is what you need (or want) they can't be beat. Fuel consumption has been greatly improved over previous models and they run on regular gas which further reduces the pain. And, its practically an American Icon; your Tahoe won't be out of place on your ranch or at your favorite 5-star restaurant.